Nilandhoo is the capital of Faafu Atoll. 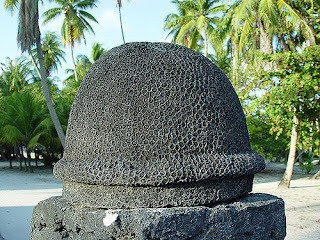 Nilandhoo has its own specialty other than rest of the islands of Maldives, include the historical place in Nilandhoo. It is well known as foah'mathi. It is told that there is a Temple of Buddhist under that, where idols are also there. Nilandhoo "Aasaaree Miskiy" is the second mosque built in the Maldives. Fishing is main occupation of citizen of Nilandhoo. However a number of peoples engaged in Agriculture, construction, & resort works. Few numbers of families live in Malé for both office works and to provide good education for their children. The island has 26 mechanised vessels, 8 bokkura used for fishing, 1 yacht Dhoni and 2 sathari dhoni used for travelling between island & Male'. It has three retail shops & four cafes. Nilandhoo health center was opened in mid 1996. Since then basic health service is available at Nilandhoo. The health center was run by Nilandhoo island development committee then. But after government shifted atoll capital from Magoodhoo to Nilandhoo its name converted into F.Atoll Health Center. The island has 2 private pharmacies with 2 qualified pharmacists.